If you've got an T-Mobile MDA or a Cingular 8125 and are planning to switch from one GSM provider to the other, here's a guide to unlocking your phone so you don't have to buy a new one. The short version of the instructions are: download the unlocking tool, run it, write down the SIM unlock code, insert the new SIM, and enter the code. 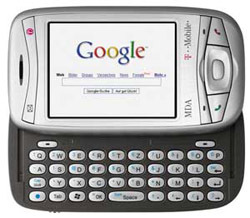 We just did went through this process this morning on our T-Mobile MDA and it's working great on Cingular's network.